So, with the best wireless printers, you can forget about having to trail cables from your PC to your printer, as all you need is a power socket and a Wi-Fi network. Your printer doesn't even need to be in the same room as your PC, which gives you more options when you're thinking of where to install it. Plus, if you're on a laptop, it means you've got the freedom to move around with the mobile device, while still being able to print from it. These days, the best wireless printers will also be able to print directly from mobile devices such as laptops, smartphones and tablets, which means they are far better suited to modern life, where many of us use these devices for working on. With all the functionality a small business could need, this feature-packed inkjet can do anything from sending a fax, to saving a scan to the cloud. Most surprisingly, given its A4-size footprint, is its ability to print on A3 paper. Wi-Fi is built in and Brother’s companion iOS/Android app makes wireless printing a breeze. It prints clearly in monochrome, while colour photos look quite vibrant on photo paper. The touchscreen is rather small and it’s not as fast as a laser printer, but it strikes a good balance between performance and features. If you have the space for it, this multifunction device will serve a small business well thanks to its consistently crisp print quality, useful 35-sheet automatic document feeder and automated photocopying skills. 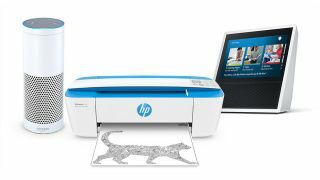 With both Wi-Fi and NFC connectivity built in, it makes mobile printing via the excellent HP mobile app especially easy. This is a mono machine and it’s not the fastest laser on the block, but it’s quicker than any inkjet and offers an attractive blend of features and performance. Canon has done well to cram as many features as possible into this delightfully compact small-in-one. There’s no fax facility, but it’s exceptionally well connected with Ethernet, USB and SD card ports, pus Wi-Fi and NFC for speedy wireless printing. It also manages to incorporate six separate inkjet cartridges which helps it achieve more lifelike photo prints. Epson reckons its EcoTank system cab save up to 70% of your ink costs and there’s certainly something satisfying about filling up the clear plastic reservoirs yourself. With everything from a fax facility to integrated Wi-Fi and AirPrint on board, this four-in-one could prove a useful and economical companion for the home office. The iPrint iOS/Android app makes it particularly convenient to print wirelessly and while it is slow to print, the results are crisp enough. Samsung’s simple square-box design hides a sophisticated colour laser printer that offers both Wi-Fi and NFC wireless connectivity. This makes it especially convenient when you use Google Cloud Print, AirPrint or Samsung MobilePrint from your Android, or Apple smartphone. It’s a little slow for a laser, but with plenty of room for paper and toner, it can handle a heavy workload. Brother has endowed this hefty laser printer with all the features a small business might need. It can hold 300 sheets of paper and turn out mono or colour pages at the rate of 31 per minute. There’s a fax facility and electronic document feed for automated tasks. It also makes wireless printing from a mobile device, or scanning documents to the cloud very easy using its built in Wi-Fi and a slick iOS/Android companion app. Both Google Cloud Cloud and AirPrint are covered. Canon’s compact small-in-one hides a wealth of features from a fax, to a 20-sheet automatic document feeder. It’s exceptionally well connected too with both Wi-Fi and Bluetooth built in, so that you can quickly connect a mobile device and print or scan using the excellent companion app. Printing and scanning via the cloud has never been so simple and photos look satisfyingly vivid with Canon’s five-cartridge system. Laser printers tend to be a lot larger than their inkjet cousins, but HP has turned that on its head with this toaster-sized device. It can only print single-side mono pages, but it can do it more quickly and economically than most inkjets and it’s small enough to carry around with you. You can connect via Wi-Fi, or Wi-Fi direct for wireless printing via AirPrint, or Google Cloud Print. The slick iOS/Android app by HP can help you with this. At less than £40 (around $52), this three-in-one printer is something of a steal. Of course the catch comes with the relatively high price of the inkjet cartridges, but if you take out HP’s Instant Ink subscription, even this cost drops. The printer itself is rather flimsy, but it’s well kitted out with Wi-Fi and Wi-Fi Direct built in for easy wireless access via the rather good HP companion app. Epson’s conveniently compact three-in-one printer includes useful features like an SD Card slot, duplex printing and Wi-Fi Direct (as well as Wi-Fi) at a very reasonable price point. Expensive inkjet cartridges make it uneconomical for the busy office, but for occasional use, this is a very easy and reliable wireless printer that can turn out black and white pages surprisingly quickly.